One of my major goals this year was to complete some intense subject-matter training. The in-person UC Davis certificate program in paralegal studies began in June. It’s been exhausting, and will continue to be up through mid-November, but I am already seeing returns on this investment. Besides the study materials coming in handy at my day job at the law office, learning how lawyers think behind the scenes about their work has led to a major breakthrough moment in how I approach my legal translation projects! Issue—Can I certify this translation? Rule—In the US, anyone can certify a translation they produce by signing a declaration under penalty of perjury that they are qualified and have done their best work. Analysis—I am qualified, did my best effort, and will sign a declaration to that effect. Conclusion—Yes, I can certify this translation. Now, I’ve translated quite a few divorce decrees in recent years; I know what laws to expect, the general order of the basic parts of the argument, and I know the terms of art to plug in. Last week, though, when I received another run-of-the-mill Hungarian divorce judgment, without even consciously considering what I was doing, I broke the Hungarian text down according to IRAC principles. It was like getting a new pair of prescription glasses—I thought I could see before, but it’s so much clearer now! All of a sudden, not only do I understand what the words mean and how to render them in English, I also understand how the Hungarian judge was analyzing the parties’s request and facts to reach her decision. In hindsight, the differences in the source text and a parallel American judgment make total sense, based on the differences I already know about the syntax of the languages. Hungarian sentences play with word order so that the part being emphasized comes first (think Yoda-speak: Hungry, I am!). The Hungarian legal argument followed a similar pattern. The basic structure is, “Regarding issue A, the conclusion is X, because of our analysis in light of Rule P.” Besides the issue, the decision is the most important thing in a court document. The American IRAC structure is turned to ICAR in Hungarian. Figuring this out won’t outwardly change my translations—in legal translation, it’s a no-no to reorder the paragraphs—but it was certainly a fun surprise to read an everyday project in such a new way. If you’ve been on the fence about investing in some subject-matter training, dive in now! What special training have you taken recently? How has your work surprised you lately? Share in the comments below! I know that most translators rely more heavily upon internet-based resources (and why not? there are so many good sites out there!). However, hopefully this is not to the detriment of your bookshelves. After hours staring at a screen, it can be a welcome break to flip through a tangible resource—not to mention that books published professionally, it being no inexpensive feat, are often vetted a bit better than websites before going to press. 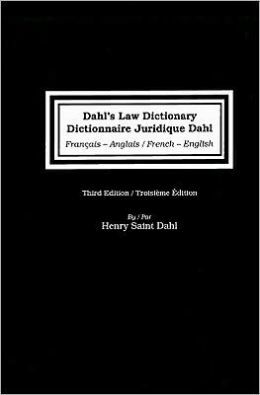 The newest addition to my office library is Dahl’s Law Dictionary (3rd edition), by Henry Saint Dahl and Tamera Boudreau. In an incredible stroke of luck, I was able to give it a test run almost immediately with a lengthy new translation project. Results? It’s an OK dictionary. I love that it has lengthier explanations of terms like biens corporels and mandat, for instance. It’s helpful to learn a bit more about the French system in an American context before making a choice about how to translate a phrase. There are some noticeable absences, such as the seemingly dozens of different types of juges or avocats one can encounter in French law. Terms are grouped by type of law (criminal, family, property, etc.) in the front of the book, which could be useful for French-learning lawyers but is less useful for someone seeking out straightforward terminology answers. That odd choice in use of print space is a bit frustrating when the more important, absent terms were left out in favor of non-law-specific terminology like discipline, fortune, and photocopie. I am well aware that many new volumes could be added to this book, and it could be endlessly supplemented with new words, phrases, and derivatives (xvi). Still, for someone new to the legal field, lawyers wanting to extend their practice between France and the US (wine country practitioners, perhaps? ), and current translators wanting a more thorough explanation of certain terms, this is a decent starter resource. You can learn a little more about the French system on every page. The French-English version is available here, and there is a Spanish-English version available, too (now in its 4th edition). What physical resources do you keep on hand in your translation space? Share your recommendations below! 1. Legal writing is mainly persuasive argument that follows a set structure. It’s a logic flow. Take your first pieces slowly, digest them paragraph by paragraph, sentence by sentence, clause by clause. Read enough and you’ll start to notice patterns, which makes future reading much more accessible. Alternatively, you can search for templates of the same type of law text here to help you see the basic framework from the start. 2. Take notes as you go to help keep track of the cast of characters, key terminology (capitalized nouns), and the main arguments at play, if you find they are buried under fluff or seem inconsistently used. 3. Recognize boilerplate for what it is—standard language that spells out a lot of definitions and assumptions. It can be tedious, repetitive, obvious… I sometimes skip it and then refer back when I get to a section that needs clarification, rather than trying to keep track of all the minutiae from the get-go. 4. Skim for keywords (by sight or by computerized search) to help you hone in on parts relevant to your query. This gives you a focal point, something to grasp hold of as you delve deeper into the jargon. 5. Accept that some legal writing is just poorly written. Don’t beat yourself up if you find it maddeningly obscure—you may be right! Take another go using a structured plan of attack, and walk away before you melt down. Stay calm in the face of madness. Sketch your own brief of the document using a journalism approach: skim quickly for answers to specific questions, one at a time. Start with the Who, then the What, When, Where, How, and Why does it matter. Take breaks often. You can also speed read and jot down the keywords that jump out at you (think of it like a reading version of one of those “hidden image” visual games—let the superfluous words blur together so the important ones can stand out). Legal texts are often no more complicated or bloated than those long-winded speeches by that guy at your morning meeting, or academic papers you read in college. You can do this! How did you learn to read legalese? What works for you when tackling a more complicated or new style of text? Last month, we explored the English language from several different angles, including its history, current trends, and revision tips. This month, we’ll be looking more specifically at language, translation, and the law. Legal language basics: Plaintiff, petitioner, or…? Why choose a translator for your discovery process? Are there any questions you would like answered related to this topic? Ask away! And three classes offered by the law faculty of the Sorbonne (in French), from the blog Words to Deeds. If you don’t see something here that piques your interest, I encourage you to at least check out the different course providers. Local translator and client associations, MOOC providers like Coursera and FutureLearn, and local colleges or universities offer hundreds of different ways to improve your understanding of your specialty subject matter, source language, target language, business practices… I could go on forever. I recently sat in on a conference call offered occasionally by the Antitrust Section of the American Bar Association to discuss developments in e-discovery. The general reaction I heard from lawyers about e-discovery—meaning, the use of technology to sift through mountains of documents for the few that may be relevant to a particular case—can be summed up in one word: suspicion. Sound familiar? Lawyers use predictive coding to extract needles from their haystack of possibly useful texts just as translators use machine learning to extract terminology from their source texts or a corpus. Both professions can benefit from this technology, but many companies and individuals are incredibly mistrustful of the tools. Show your work. Be transparent about your process. For both lawyers and translators, this means defining different quality control stages and documenting the output at each stage. It also means understanding very clearly the limitations of your tools and ways you can work around these limitations. For instance, everyone knows that spell checker tools can’t distinguish between errors like “they’re” versus “their,” so professional writers use human proofreaders at a final stage to correct what the software cannot. Make multiple passes through your texts to better control how your work gets refined. For lawyers, this means using several, gradually narrower search queries to pinpoint key documents, rather than using one “high-powered” string of specific search terms on the very first go. For translators, this means doing your background and terminology research, then using your CAT tool, then using a concordance tool, then perhaps a special spell checker, and so on. Bottom line: when working with huge volumes of information, even when using technology-based solutions, it’s more effective to take small bites multiple times than trying to swallow the whole project at once. Spend a significant amount of time training your tools with a significant number of texts in order to teach it to produce results backed by statistically significant confidence levels. Have a human expert review and approve the results of the machine work before using them in a professional context. This was the most-repeated suggestion throughout the call. People are far more likely to trust a machine that is taking over a formerly human task if a seasoned professional can confirm that the machine is, in fact, performing well. Even if you only confirm a [statistically significant] sampling of the machine output as high quality, you will exponentially increase your client’s comfort with the non-human processing of language. Where else have you heard concerns from the translation industry cross over into other fields? How have you addressed concerns about technology use in your field? What do you do to make sure your time savers work properly? I really can’t stress enough how important it is to fit continuing education into your routine as a freelancer, whatever you do. It’s not just me—check out Corinne McKay’s takeaway from a conference she attended recently. “Stretching your brain” and exploring new ideas will always help you see your work from a different point of view. And that’s a very good thing. The course is designed for students interested in learning about the business-legal aspects of entrepreneurship regardless of educational background. In addition to discussing applicable legal rules, the course will focus on practical steps entrepreneurs and their lawyers can take to build and protect a new venture. The goal of the course will be for students to have a better understanding of practical ways they can protect a new venture and spot potential issues from a business-legal perspective. How fantastic does that sound for newly-launched translators?! Or those who want a fresh perspective on running their established business. Even though I’ve been at this business full time for over a year now, I jumped at the chance to register. Discussing the law will benefit me as both a legal translator and as a sole proprietor. How might it help you? What classes or conferences are you planning to attend this season? How do you plan to stretch yourself professionally? Legal language: What is an MFN clause? Let’s talk about what the heck MFN clauses are, anyways. Why use the word nation in a clause between businesses? The term comes from a principle of non-discrimination in world trade agreements, whereby no country may offer special prices to another without also extending the favor to other nations bound by the same trade agreement. Sounds reasonable in this context, right? 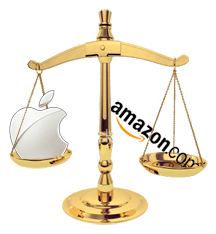 In brief, when Apple entered the e-book market, it had a hard time competing on price against Amazon, then the e-book retail leader. 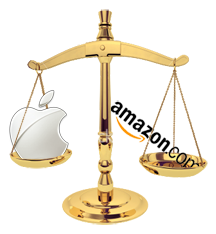 Apple decided to let publishers set their own price for e-books, unless a better price was found on the market. Then, the publishers would have to eat the loss, giving Apple their e-books for the lowest marketed price available. Apple could thus compete on price without reducing its own profit margin. As a result, these publishers decided to amend their contracts with Amazon, too, to limit their own losses—or else they would cease supplying Amazon with popular, new e-books. From the facts and timelines in this case, it is clear that MFN clauses can be used to manipulate markets as a way around price fixing regulations. I’m sure we’ll be seeing more of these cases cropping up over the next year or so. Foreign language document review: why choose a translator? I recently attended an excellent ATA Webinar on the role of the linguist in legal document review. In my market (Washington, DC), more and more law firms are requiring their document reviewers to have at least a J.D. to get near their foreign language discovery files. If only they knew what they were missing out on by excluding so many professional linguists! Legal translators are an excellent choice for document review teams. Why? Linguists are neutral to the case. This means we won’t skim over anything important-but-damning—our facts reported are just unemotional facts. Linguists are educated in both sets of laws. We can help you understand why a société anonyme (French) is similar to, but not quite equal to a limited company (UK English) or an incorporated company (US English). Linguists create better glossaries and cheat sheets. Trial lawyers can be sure they are using terms consistently in references to their evidence base, and possibly even use some of the foreign words [correctly] at the negotiation table or trial. Not only are we efficient, we make you look good, too! Linguists are trained to pick out small details that make a difference—a sudden switch to exclusive, singular nouns after using inclusive plurals, for instance. And we always get our date formats right! Linguists can handle a wider variety of documents. Sometimes your key piece of evidence will come from a standard contract or patent. But just as often, it will be in email form with lots of slang and abbreviations, or handwritten notes squeezed into margins, or tax tables. Professional translators deal with these documents regularly in the normal course of their work. Their analysis won’t suffer from an unexpected twist in writing style or format. Translators, can you think of any other reasons why lawyers should add you to their discovery team? Lawyers, what has your experience been working with linguists on document reviews? I’m going to share a secret regret of mine today: when I first started working on very large projects in teams, I used to doubt my word choices a lot. I assumed my teammates were better educated and deferred to them in terminology debates. It generally worked in my favor—I learned new words or phrases, and my translation improved. But there was one time that sticks out in my mind when I should have spoken up. I was working on a very long set of documents for an antitrust case. In brief, large group of international companies X had conspired against individual businessperson/inventor Y to prevent Y from finding a manufacturer for a new-and-improved product, because Y made better, more cost-effective improvements to a tool than X’s team had (despite 20+ years working on the project). In translating these documents, the term “anticompetitive practice” (pratique anticoncurrentielle) came up quite a lot. You can see how that English-language term is appropriate: group X conspired to keep inventor Y from marketing a new invention. They did not want competition. My translation partner (chosen by the agency client, not by me) decided this phrase sounded too clunky, and opted for “unfair trade practices” instead. Here’s where I hang my head in shame and say, “I went along with it.” You see, this other translator had solved another inelegant wording problem far better than myself. So somehow, I assumed that meant the other translator was better all around. Omniscient. There is a difference between anti-competition and unfair trade. The former deals with conspiring to prevent other businesses from competing in the pre-production or pre-sale stage. Anticompetition affects other businesses. Unfair trade has more to do with bamboozling buyers, infringing on patents already in use, and other practices that affect consumers. I should have held my ground. I knew I was right, but with the deadline looming and no time to provide solid citations in support of my choice (and with respect for the other translator’s solution of other problems), I let it slide. Luckily for us, there were aspects of unfair trade (as opposed to anticompetition) involved in this case. So while it wasn’t a perfect solution, it was still acceptable. The client and other readers would still understand the legal meaning of the document. It’s just one of those decisions that comes back to haunt me from time to time. You live and you learn! What rookie mistake did you make once upon a time? How do you deal with terminology debates on team projects?